Huge Savings Item! Free Shipping Included! 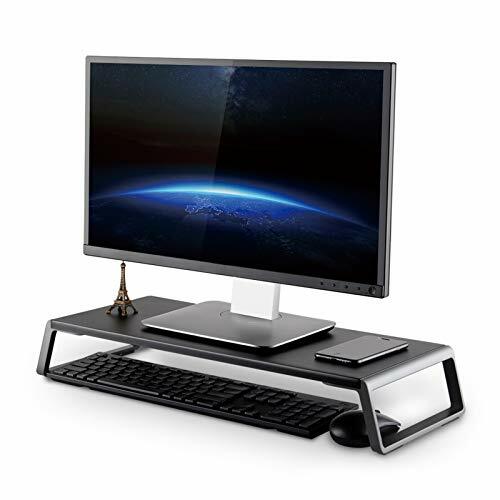 Save 17% on the UPERGO Monitor Stand Riser with Metal Feet for Computer Laptop iMac TV LCD Display Printer, Computer Monitor Riser with Desk Tabletop Organizer 20x9.45inch Sturdy Platform Save Space,Black(ID-20B) by UPERGO at Andy Pemberton. MPN: ID-20B. Hurry! Limited time offer. Offer valid only while supplies last. 【MDF AND ALUMINUM FEET 】--This monitor riser is made of MDF platform and aluminum feet with inserted silicone pad, hold up to 22lbs without wobble, durable and sturdy. 【ERGONOMIC ELEVATING HEIGHT】--Elevating your screen up to 3.58inch for comfortable, ergonomic viewing experience,reducing pains on your neck and back. 【DESK ORGANIZER】--This monitor stand easily free up more space on your desk, you can put papers &slide keyboard and mice under the stand to make your desk out of the clutter. 【20"X 9.45"WORK AREA】--Tabletop measures: 20"x9.45", simple and compact, modern style fits perfectly into any devices in office. 【FULLY ASSEMBLY】--Take out of the box and put on your desk, place any devices you want such as PC Monitors, Computer, iMac, Printer, Laptop, TV LCD Display, etc, you can enjoy your time now! If you have any questions about this product by UPERGO, contact us by completing and submitting the form below. If you are looking for a specif part number, please include it with your message.